Mechanical Engineering graduate student Luke Roberts has been awarded a three-year National Science Foundation (NSF) Graduate Research Fellowship. Roberts, a second-year Ph.D. student advised by Professor S.K. Gupta (ME/ISR), is involved in the Robo Raven micro air vehicle project. Roberts' research deals with actuators--motors and structures that initiate and control a robot’s movements. The more actuators a robot has, the more complex and dexterous it is. Having many actuators also can make a robot more robust--able to keep working even if some of its parts fail. "Eventually, I'd like to build a robot that can swim, fly and work on land," Roberts says. Robo Raven is being developed to include both active actuators, like motors; and passive actuators, “compliant” structures that respond to outside forces. In the Advanced Manufacturing Lab, Roberts works on developing wings that can change shape as they flap in response to differences in air pressure. 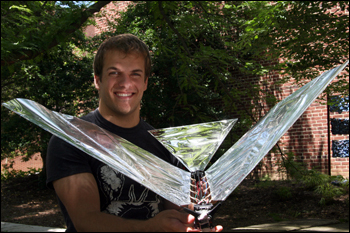 The NSF Graduate Research Fellowship Program recognizes and supports outstanding graduate students in NSF-supported science, technology, engineering, and mathematics disciplines who are pursuing research-based master's and doctoral degrees at accredited US institutions. Approximately 2,000 fellowships are awarded each year.